Fun piece by columnist Dan Barry in the Times about the portrayal of journalists in U.S. feature films. –How did he do this whole piece without ever mentioning the essential resource in this field: the Image of the Journalist in Popular Culture program at USC? Either he didn’t do a whole lot of research, or he didn’t want to steer readers to a more authoritative source? –The Times piece is illustrated by a still b+w photo from the iconic film comedy “His Girl Friday.” So far, so good. But the photo is credited to “New York Public Library.” Now, the paper may have found the photo there, but that doesn’t mean the Library has the rights to it. In researching the illustrations for my book, Covering America, I found (to my regret) that the rights are owned by Sony Pictures Entertainment, which does not give away the right to reprint those images for free. 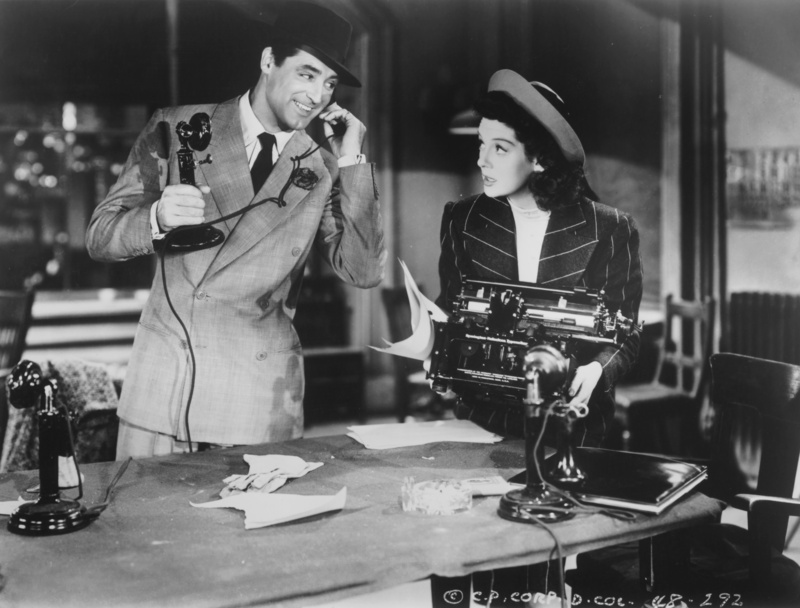 For use of a different still from “His Girl Friday” in my book, Sony charged me $75. Still from the film classic “His Girl Friday,” set in a newsroom.